A month of attacks on the ministers of the Abe government in the Diet over potential violations of campaign finance law have done nothing, or less than nothing, for the fortunes of the main centrist opposition parties. They are not in appreciably better electoral position than the Communists, who are better funded. The Communists of course blow their cash on running for every possible seat on the ballot -- but that kind of moxie keeps the adherents loyal. When the April local elections roll around, the voters will look at the Democrats and the Innovators (?) and rightly ask, "Yeah fine but what can you do for me and when do you think you will be able to do it?" Has anyone noticed, in this year of big East Asian relations anniversaries (70th anniversary of the end of World War II, 50th anniversary of the normalization of Japan-Republic of Korea relations) that if the relations between the Big Three countries of the region were to improve then the United States would feel free to dial down its presence -- which is precisely what two of the Big Three -- Japan and the ROK -- absolutely do not want the U.S. to do? "Hakko ichi-u" (八紘一宇) is found in the Nihon Shoki, the words of the prayer "ama no shita oite is to nasamu" (掩八紘而爲宇) the ancient era Emperor Jimmu is reported to have said at his accession. This "Hakko ichi-u", in simple terms, "Shall I not found a nation where all can live together as one family?" It is not often that Minister of Finance Aso Taro is struck speechless. He almost never intimidated by a microphone. More often than not, Aso Taro's tongue and public manner are way too loose, resulting in outrageous, off-the-cuff bombshells that are the despair of his bureaucrat handlers. On Monday, March 16, however, Aso Taro was struck speechless. Well, not exactly speechless, just wishing desperately, hopelessly, in sweating, head-shaking abandon that he could find a way to get away from a microphone WITHOUT SAYING ANYTHING. LDP member of the House of Councillors Mihara Junko has been turning heads since she was 13 years old. In that year she appeared in her first television drama. Her reward for her precociousness was getting herself kicked out of her elite private school, having not cleared her appearance beforehand. She finished her middle school years in a public school. "Not the face. The face is bad. Do it to the body, the body." was a surprising (?) hit. 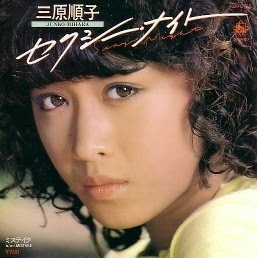 Her burst of hit singles landed her a place on NHK's end-of-the-year Kohaku Gassen program two years later. From then until her marriage in 1999 Mihara appeared in numerous acting roles, though always seemingly typecast as either the villain or the evil accomplice. She was also a much sought after model and product spokesperson. Over seven years she compiled a record of 23 finishes out of 31 starts in three different car classes, her highest finish being a 9th place in 1995 (Link). Her driving career also reportedly featured seven accidents resulting in broken bones. In 1999, Mihara married television celebrity and talent agency manager Coala (real name: Miyatani Nobuya) and settled down to what she must have thought would obscurity with her husband as the breadwinner. In 2007, however, her husband's talent agency went bankrupt. The couple divorced (as it turns out, it was to be her husband who was to fade into obscurity. Nikkan Gendai found him in 2014 running a production company organizing shows at shopping malls). A year later, Mihara was diagnosed with cervical cancer. She had a complete hysterectomy to save her life. The political recruiters came knocking, and soon. In addition to her fame, her inspirational story of cancer survival, her looks (she caused a stir when she had her face remade on camera, having botox, laser spot removal and minor facial surgery done live) Mihara had also revealed herself to be a rock-ribbed conservative. She said (and continues to say) all kinds of internationallly problematic things about comfort women, about the Asahi Shimbun and about Yasukuni (she pays her respects at the Spring and Autumn festivals as well as on August 15). She is against separate surnames for married couples (Link - J) -- kind of surprising, given her former profession and divorce. On Monday, Mihara was the seventh and penultimate questioner in a session of House of Councillors Budget Committee session. Sitting in the front row of the seats reserved for Cabinet members were Prime Minister Abe Shinzo, Finance Minister Aso Taro, Economics Minister Amari Akira and Rural Revitalization Minister Ishiba Shigeru. They waited for the questions Mihara was to put to them. They waited a long time. Mihara began with a long and pretentious speech about the social and government response to the Jogan Earthquake in 869 CE. It seemed a bit of a stretch to start out with a tale of Emperor Seiwa reducing taxes in the affected provinces of Mutsu and Dewa (the modern Tohoku) in a question time session supposedly about getting tough on corporations. However the tale of Emperor Seiwa's response to an earlier Tohoku disaster did set up Mihara's introduction of the supposed Emperor Jimmu prayer for hakko ichi-u as a model of modern international behavior. Mihara's hobby horse, upon which she was to ride into controversy, is corporate tax avoidance. For her (and for many others, all around the world) it is wrong for "companies like Amazon to make use of Japan's infrastructure and yet pay no taxes to maintain it." It is also wrong in Mihara's view (and again, for many, many others) that corporations can claim tax exemptions through legal but clearly spurious corporate registrations in places such as the Cayman Islands and Guernsey. It was in this context that Mihara introduced, or reintroduced, the phrase hakko ichi-u. 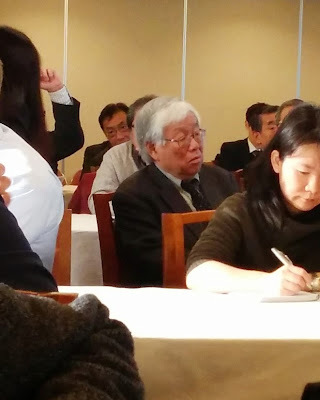 Would it not be better, she asked Finance Minister Aso Taro, if the global standard of corporate behavior be one of hakko ichi-u, where the strongest corporations play the role of leaders and protectors and providers in their countries? She then read out the passage, paraphased in the blog post above, from Shimizu Kentaro's Kenkoku (1938). Aso Taro is not a man necessary familiar with the thought of economic and social writers of the pre-war era. He knows when to steer clear of the land mines of public discourse, though. 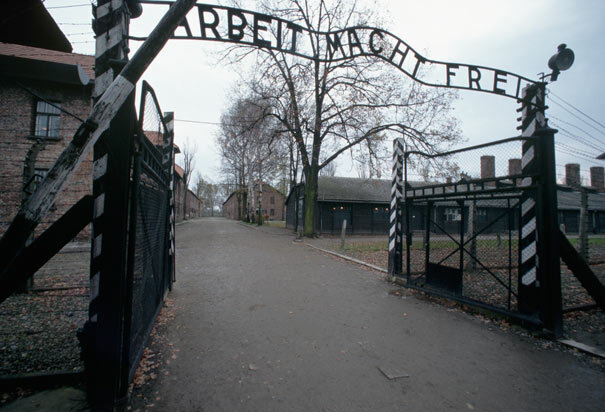 "You know, we used to have a phrase in this country 'Arbeit Macht Frei' that really expresses the liberating feeling of being involved in gainful employment. Mr. Minister, what do you think of this idea as a model for our contemporary era?" Well, uh, there were only two of use here (gesture) born before the end of World War II. Uuhhhh. There isn't anyone else here I think. Uh, there is standing in Miyazaki Prefecture a so-called Hakko Ichi-u tower. Noone from Miyazaki Prefecture here? (gesture). There is a hakko ichi-u tower, isn't there? You don't know yes or no? Well, uh, oh, Fukushima-san [former leader of the Socialist Party Fukushima Mizuho - Ed.] you know about it? I have no connection to Miyazaki Prefecture but uh hakko ichi-u is that kind of thing, you know. You see they brought all these stones from every prefecture of Japan, piled them all up and called it hakko ichi-u, and it is in Miyazaki Prefecture, I think...and it appears in pre-1945 songs, like in Ike, hakko to ie nashi and such...there are lots of such songs. Anyway, that there was this kind of thing where, well it was one kind of mainstream thought, I think. As for myself, well, you know...hmm, how to say this...because this was in a world of more than 1500 years ago, where if one is going to say anything, what we call the country of Japan today, that country, when saying the same word is the same place, for any place other than Japan of these emperors of the unbroken line back to the beginning of time, it's not applicable. Other than Japan there is probably not a country that exists now that existed before the 10th century when Denmark appeared, or thereabouts... where in the 5th century the Nihon Shoki existed as a document written in a foreign language and the Kojiki existed as a document written in the Japanese language, a well established nation state...well there aren't any. That the country has continued to exist in this form, uninterrupted is perhaps what this Mr. Shimizu was trying to say in his writing. Aso then strode away from the dais, quickly. The monument to which Minister Aso referred does exist. It is, as he surmised, in Miyazaki Prefecture. It was built in 1939 for the 2,600th anniversary celebration of the accession of the Emperor Jimmu, a 1940 event remembered by few now living. A few years back Kenneth Ruoff of Arizona revisited the all-encompassing commemoration in his Imperial Japan at Its Zenith (2010). And as you can see in the top photograph and on the website for the park, the incongruously named Heiwadai Koen ("Peace Plateau Park" - Link - J), the monument is a stunning, sinister, Brutalist Angkor Wattish stone tower, with the phrase prominently displayed on the front. Gotta go there someday. Really. Here, by way of reference, is the Asahi Shimbun's English language version of the story (Link). I disagree with their characterization of Aso's response. In the archived video on House of Councillors Television (Link - J), Aso looks absolutely furious about being questioned on hakko ichi-u. 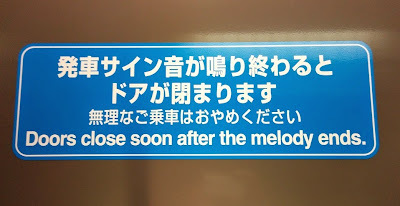 Later - Many thanks to reader MK for the link to the Heiwadai Koen website. Huffington Post, "'Hakko ichi-u' to wa nani ka? Mihara Junko giin ga hatsugen shita kotoba wa GHQ ga kinshi shite ita." Retrieved at http://www.huffingtonpost.jp/2015/03/17/hakko-ichiu_n_6883314.html. I know, I know. I have the voice of a 25 year old, at best. As for the photo, I took it at home in October 2013. Really. 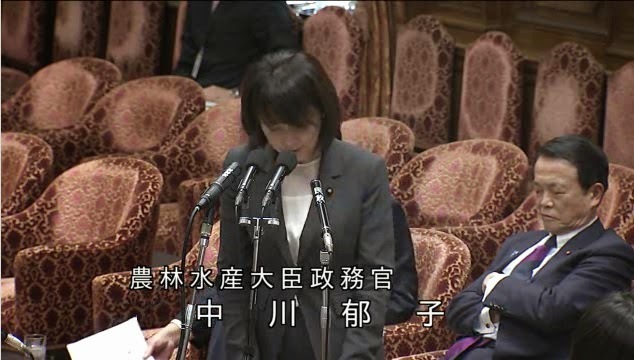 For Japanese speakers, here is the link to a report from Fuji Television on Liberal Democratic Party Policy Research Council Chair Inada Tomomi letting the cat out of the bag as regards to what may have always been the goal of the bill (Link - J). Note how she weaves in the theme of "not just rights, citizens must have responsibilities too" found in the LDP's proposed revisions to the Constitution. And yes, this I wrote about this subject earlier this week. A few minutes ago in Diet Budget Committee Session, in one of the most crass displays of false outrage ever, Democratic Party of Japan member of the House of Representatives Onishi Kensuke called up Parliamentary Secretary for Agriculture, Forestry and Fisheries Nakagawa Yuko (Hokkaido #11) to explain her qualifications for remaining in her appointed position after she was photographed kissing her married colleague Kado Hirofumi on the night of February 23, the night when her ultimate MAFF superior Minister Nishikawa Koya resigned as minister. Oh for Amaterasu's sake. Do you have, at long last, no sense of decency? Nagakawa Yuko was 48 years old when she lost her husband. She had been from the age of 24 the silent guardian/nursemaid of a man so perpetually soused that one American official once told me, "my memories of him are of peeling him off the couches at the Imperial Hotel, putting him into a car and sending him home -- almost every night." Someone who was loved by members of the press assigned to follow him around because "with him, there was never any work to do before lunchtime." If anyone deserves a wild happiness, that sense of elation in the throes of passion, of losing one's bearings in being kissed by someone who is crazy about you -- and not just plain crazy -- think it possible it may be her. 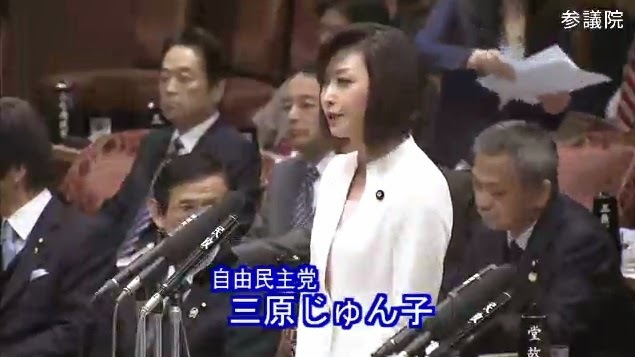 Nakagawa slowly wended her way to the microphone, apologized profusely to the Japanese electorate, promised to be the best official she could be in the flatest, most abject of monotones, never once lifting up her face. After putting Nakagawa through this public humiliation, one on top of the multitude she has suffered and will suffer (as the "other woman" in Kado's infidelity, Nakagawa should be liable for damages in case Kado's wife files for divorce) Onishi asked the PM his view of what the assembled had just heard, then moved on to badgering Minister of Education Shimomura Hakubun about his political support groups and their financing. He dragged her before the electorate, in a live nationwide NHK broadcast, to answer one question. Just one question. And then he just tossed her aside. Later - For those wishing to see the video, the active link list of questioners is here. Onishi's question time is the third from the last on the list, with the time signature "14:51." Later still - In case you were wondering how the mainstream media organizations reported on Nakagawa's alcoholism, they covered it up for nearly two decades. Even after the Rome press conference disaster, mainstream media to my knowledge never identified N. Sho'ichi as an alcoholic. And yet later still - I cannot believe it. 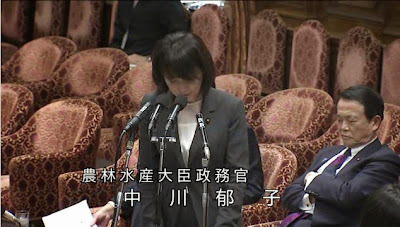 Onishi summoned Nakagawa to the Budget Committee AGAIN today (March 13) this time to apologize for having been caught smoking during her emergency hospitalization after the publication of the photographs. She again apologized, this time for violating the hospital's rules. Onishi is truly without shame or a sense of proportion. How can the DPJ leadership not rein him in? Today is the fourth anniversary of the triple disaster of earthquake, tsunami and nuclear reactor meltdown in Japan's northeast. The television news broadcasts will be full to the brim with reports on commemorations and the current situation of the residents of Eastern Tohoku. One reality the reports will not be able to avoid is the modest amount of rebuilding and resettlement completed. Few buildings have be restored in the devastated areas; even fewer businesses have been established. Over 200,000 persons remain displaced, scattered all over Japan or still huddling in tiny, cold temporary housing units. The delay in or lack of revival (fukko) of the Tohoku despite the cubic kilometers of hot political aired spewed over it is not indicative of a lack of resolve or resources. 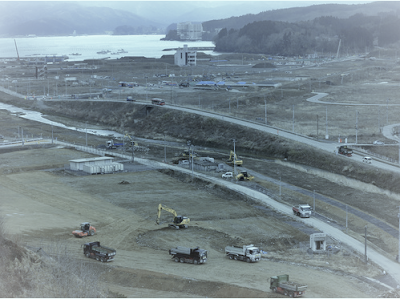 The minor communities of the Tohoku seaboard were political clients and mendicants, surviving into the contemporary era not due to their ability to generate livelihoods for their inhabitants but due to their ability to attract subsidies and development funds from the nation's core areas. They were, for the most part, places that were not habitable save under severe government intervention. Which means that Daniel Aldrich may have to provide a modification -- and not a very big one -- to his illuminating thesis on recovery from disaster. High levels of social capital in a community and social exchange in between local residents do seem to be of vital importance in speeding up recovery from disaster. However, for reconstruction to take place, the affected communities have to have had real socio-economic value for the nation in the first place. Which the seaside communities of the Tohoku have not had for decades...and under any and all reasonable scenarios never will. So if today you see or read a report condemning the lack of reconstruction as a sign of political failure, feel free to say, "No, the failure to reconstruct is not the political failure. The political failure was the continued existence of these towns and villages." As a coda, if a public official or former public official comes on lamenting about the communities lost to the rain of radiation from the explosions of the Fukushima Daiichi nuclear power station, you can say, "Phooey! The reason why the nuclear power stations were even there" -- this is from another one of Aldrich's books - "was because those municipalities were NOT communities! Communities would have banded together and rejected the plants!" Later - Please, please, please read the comments where I am excoriated for the above. 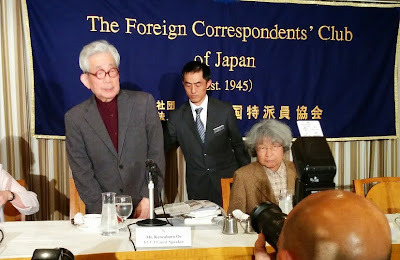 Oe Kenzaburo arriving at the FCCJ. 12:42 Journalist Kamata Satoshi is offering introductory statement of the situation in Fukushima on the eve of the 4th anniversary of the triple disaster of 3/11. 12:46 Oe begins his remarks. He speaks in a high, halting voice. 12:51 Oe points out the ridiculousness of Prime Minister Abe Shinzo's insistence in Buenos Aires that "Fukushima is under control" -- and that the attitude of duplicity (to self, the country and the world) became the seeming norm. By contrast, the German people were able to view the nuclear issue as a world issue. Japanese could not see the problem in a global sense. 13:00 "In my literature, trees play a huge role. I think the fate of the trees of Fukushima is a symbol of the scale and methodology of the clean up effort. In particular 80,000 highly contaminated large trees have been cut down, chopped up and put into storage. 13:01 One of the ideas is to burn the wood of these trees, collecting the ashes and burying it. But what of all the radiation released in the burning? While not downgrading the suffering of humans, the loss of these trees is striking to me. Trees are promises to the future. Here the future has been lost. The Germans [Oe is riffing on the ongoing visit to Japan of Chancellor Angela Merkel] thinks about the limits of technology -- that Chancellor Merkel in a conversation with Prime Minister Abe noted that despite Japan's technical prowess, control of a nuclear facility was lost. 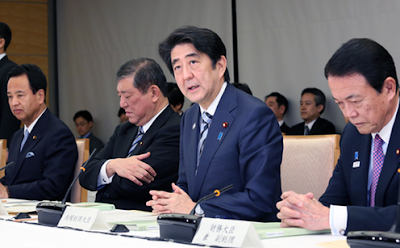 Prime Minister Abe, however, has no such reaction and reflection to Fukushima. 13:09 The current government of Japan has no understanding of the issues and no Japanese politicians who have the will and the capacity to learn from the lessons of Fukushima. This government does not pay attention to the views of non-Japanese, particularly the government of Asia. 13:19 Five years I had decided to give up the life of a novelist...I wanted to start a new way of living. I took my hints on what to do with the rest of my life from the late Palestinian-American scholar Edward Said. I had been rereading my own work when Said was diagnosed with leukemia. 13:24 Said got me thinking about the artistic style of the end of humanity or the end of a single person's life. On Late Style - his book of his views on the style expressing one's thoughts in the face of one's end...got me thinking about my end and the world's end. 13:29 Fukushima represents a late style of humankind's express of barbarism. Adorno spoke of barbarism after Auschwitz. After Auschwitz, after Hiroshima and now after Fukushima, what is literary production if not barbarism -- what would Said have said? 13:34 I want, in my late style, post-novelist period in my life to find out how others speak, how to not be involved in barbarism. The Yomiuri Shimbun is reporting a rise in the number of voters supporting lowering the voting age in national elections. Yomiuri Shimbun poll takers found in a poll taken this weekend that 51% of the voters now favor lowering the voting age from 20 to 18, while 43% are opposed to the change. When in June 2014 pollsters asked the public about lowering the voting age, only 48% were in favor and 45% were opposed. Not that this will retard the change in any way. The legislation will pass the Diet simply because no party wants to be seen as the one that voted against extending the franchise to young people. That only 32.5% of those in the 20-29 age bracket bothered to show up at the polls in December last year only reemphasizes the absurdity of this unstoppable reform. Now these unseen legions of murderous youths are forcing he LDP to consider another change, one eliminating the legal loophole that has allowed them to run rampant, transforming Japan into an ungovernable, homocidal wasteland. So give them the vote, then lock 'em up. Later - Upon reflection, that a proposed historic reform could be under discussion for nine months without a demoralizing drop in public support (on the order of 10 points or more) is an amazing thing, for this administration. So yeah, let's call this a win! Screenshot of 6 March 2015 NHK morning news caricature of U.S. Undersecretary of State for Political Affairs Wendy Sherman and East Asian leaders unable to sit down and talk because of discord over history in this year, the 70th anniversary of the final year of World War II. 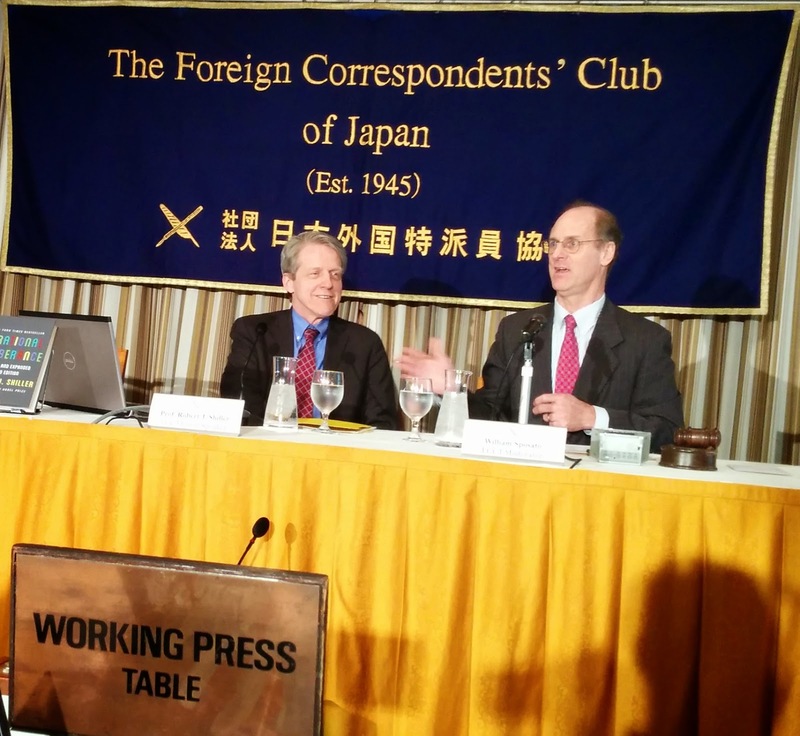 - There is a huge amount to like in Professor Jennifer Lind's essay for the Council on Foreign Relations on the prospects for warming Japan-Republic of Korea ties (Link). However, the essay does not emphasize strongly enough how the current frozen state of ties, the government of South Korea having, or pretending to have, concerns in common with the government of China as regards Japan, furthers the ROK's best interests. One would only has to consider the hypothetical of an East Asia without a Japan to realize there is nothing fundamental to the current Sino-ROK warmth, that the ROK would be in a perilous position indeed if not for the focus Japan's presence provides. Rather than offer hints about Japan-ROK spring, Professor Lind should have hammered away at the likelihood of a long frost. The knife attack this week on U.S. Ambassador to South Korea Mark Lippert (Link) and the government of Japan's revision of its description of the ROK on the Japan Ministry of Foreign Affairs website from "a neighboring country with whom we share common values of liberty, democracy and free markets" to "most important neighbors to each other" (sic) - Link J - video) may be harbingers of change in the ROK's heretofore rather cushy position in East Asian politics. 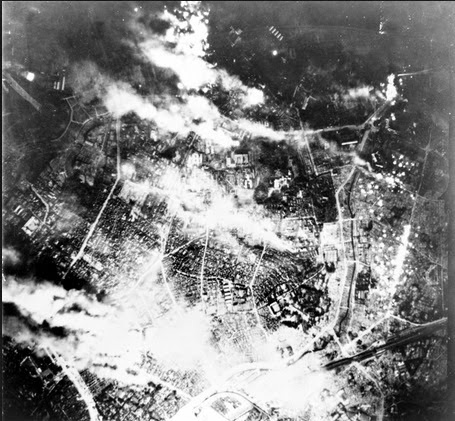 The U.S. government has been fairly tolerant toward the ROK government's and civil society's anti-Japanese radicalism, allowing South Korean activists to push past the envelope of what are normally acceptable expressions of historical anger. The government of Japan has also been mild in its responses to violence against its diplomats and citizens. The GOJ clearly has had enough of the ROK's special status. The US Gov may be less automatic in its support as well. The LDP has to be feeling pretty good about the Komeito's mild distress at this point. 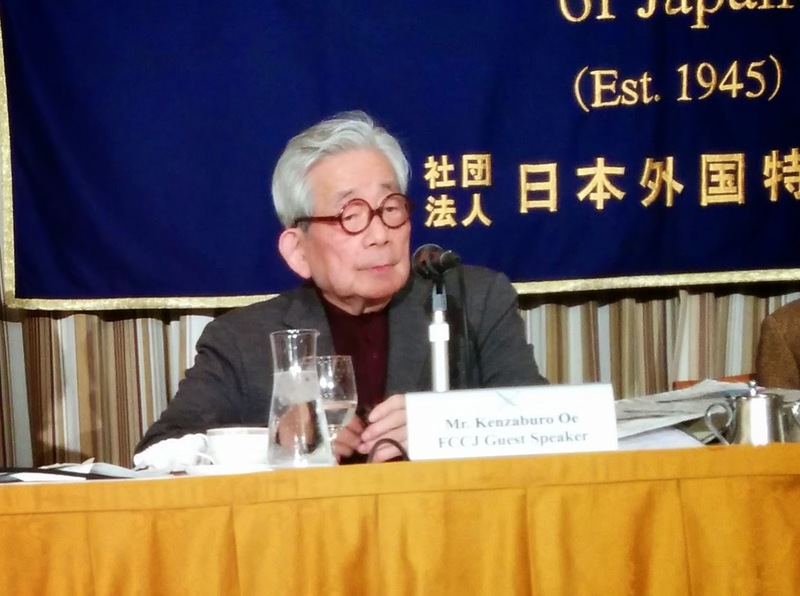 With the Unified Local Elections coming up on April 12 and April 26, the Komeito should be in the position to arm wrestle the LDP into moderating or even abandoning its more ambitious security proposals. That the Komeito is merely reticent at this point bodes well for major Komeito retreats in May. - The really big story on security on Friday was the Cabinet Decision on changing the structure of the Defense Ministry giving uniformed, active-duty officers of the Self Defense Forces direct access to the Ministery of Defense (Link). Arguments for the change are feeble: there is no evidence the requirement that the requirement to work with the "suits gang" (sebiro gumi) prevented the "uniform gang" (seifuku gumi) from acting or offering their views to the minister or director-general. Arguments against the change are the results of memory, both in terms of the nation in general and the Self Defense Forces in particular. The current structure has been supported, like the determination of the unconstitutionality of the exercise of collective self-defense, by generations of prime ministers. That the minister leading the change, Nakatani Gen, is a former member of the Ground Self Defense Forces, makes the change look less like a reform and more like a rejection of the reality of history. In a broader sense, I am beginning to think that "escape from the postwar regime" means "in our future, there will be no history." The change is still only a proposition. Like the 1 July 2014 Cabinet Decision on collective self-defense, it is not enshrined in legislation. Like the July 1 Decision, it is the subject of withering criticism from the opposition parties. 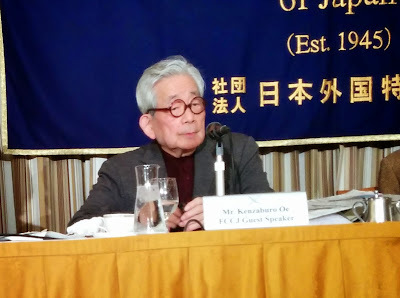 However, like the July 1 Decision, any delay or modification in the implementation of the plan depends upon the Komeito's intestinal fortitude. The warm-hearted, open-minded and hard-working crew at East Asia Forum have kindly published "Commission impossible for Abe's foreign policy," -- my brief look at the Commission for a Framework for the 21st Century, the assembly of 16 foreign policy gurus and internationally adept business folk who are to advise Prime Minister Abe on his Statement on the 70th anniversary of the end of World War II. Mari Yamaguchi of the Associated Press has published a blast on the backgrounds and writings of some of the members of the commission, filling us in on some of the quirks of the individuals involved (Link). Yamaguchi classes Globis Capital Partners chairman and Globis University president Hori Yoshito as being among the group's revisionists. Considering some of the material Hori has published in English -- let us say, this essay -- the categorization may not be unfair. Are We Headed for Another Financial Crisis? 11:06 Shiller presentation: Of course there is going to be a crisis, the history of the last 800 years is a cascade of crises. 11:08 My view is that financial crisis is a crisis of human emotions, the loss of confidence, a psychological effect. 11:10 The weakness/source of concern now is bond markets, where prices of bonds seem way out of line. 11:11 So talk today is about stock markets, housing markets and then some observations of world bond markets, where the yields are startingly low. 11:15 Cyclically adjusted price earnings (CAPE) in U.S. markets are at their third highest marks in history, second only to the 2000 millenium boom and the 1929 Roaring Twenties. 11:16 Japanese CAPE ratios were astronomical in the EARLY 1980s but now shrunk to global norms. 11:18 Japanese confidence in rising share prices remains aberrantly positive. 11:20 U.S. economy is now in deflation. 11:21 Trend in yields in U.S. bonds in relentless downward, and downward at an almost constant rate for the last 30 years. 11:22 Trends in bond yield declines are a global phenomenon, somewhat irrespective of the particular actions of central banks. 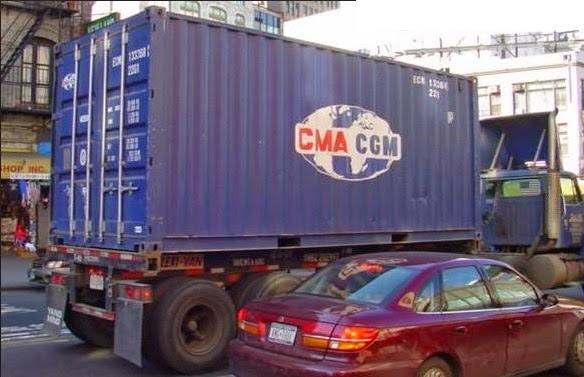 11:25 The result is excess savings and the bidding up of the prices of existing businesses and governments. The lack of security is thus leading people to cut back spending and/or starting their own businesses. 11:27 Entrepreneurial and development successes are receding, leading to weakness in confidence that is often called secular stagnation. 11:31 The "Three Arrows" are actually concrete proposals, not an attempt to talk up the economy. That is what makes the proposals worthwhile, as just cheerleading has a poor record of success. 11:33 Shiller - NASDAQ high yesterday, adjusted by CPI inflation, is not at historic highs. So not so significant. 11:34 Japanese confidence bled into world markets, distorting international flows toward Japan, in the same way that overconfidence in tech magic led to NASDAQ historic highs. 11:37 Shiller - I had a conversation with Prime Minister Abe a year ago - unfortunately I (Shiller) did most of the talking so I have little so say about Mr. Abe's thinking about Abenomics. 11:38 (Says an interesting thing about labor force security - MTC here). Shiller sees the easier firing of Japanese workers as a good thing for efficiency. Intriguing...really? 11:42 In the U.S., there is a socialist economy in the housing markets. 11:44 Schiller - Decision to create the euro was politically an act of genius and not an act of genius economically. Euro is important as a symbolic act, but one with too many economic consequences. Symbolism is good. 11:47 Income inequality - Piketty, capital accummulation; Shiller, technological inequality. 11:48 Shiller quotes Norbert Wiener on whether the nuclear weapon or the computer is more dangerous. Worries about robots replacing human labor. 11:50 Abe advisor and fellow Yale economics professor Hamada Koichi is offering commentary on the presentation. 11:51 Hamada: "There is a rosy future for the Japanese economy." 11:52 Hamada: "Mr. Abe is holding back, allowing the figures to speak." "Oil prices are a positive. A million workers have entered the labor force. Wage are increasing. 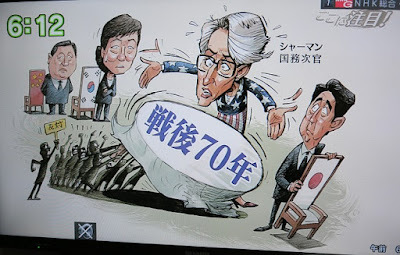 But Abe must do reforms, overcoming obstacles." 11:54 Hamada+Shiller - Womenomics is important. Shiller: it is inspiring. Hamada: numbers are returning (???) to the job market. 11:57 Q: with true declines in populations and aging of populations, is not there no exit out of slowing or contracting economies? Shiller: government policy to combine career and family is an important step to reversing or slowing decay in confidence. 11:59 If you want to end inequality, you should have career insurance -- takes care of the insecurity of life planning. Governments must have a plan to tax the wealthy and subsidize work, do it now for the future rather than try to deal with inequality (worsening?) in 20 year's time.